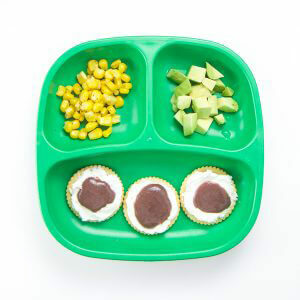 If you read my last post, 4 Healthy Toddler Lunches, and are still struggling with creative, yet easy ways to get your picky toddler to eat a healthy lunch without any fuss, I’ve come up with 5 more toddler lunches that find a balance between healthy and fun. 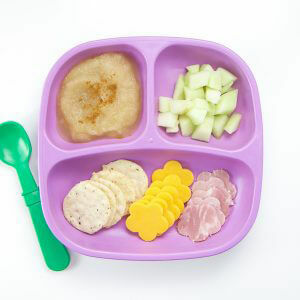 With these bright colorful yummy lunch combos, your toddler will finish their plate in no time! 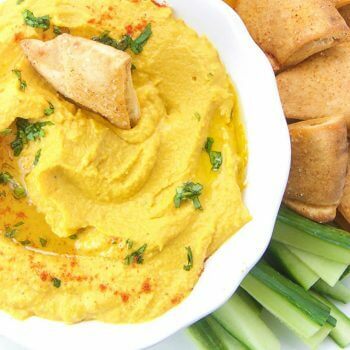 Cream cheese fruit crackers, warmed corn with a pinch of paprika and chopped avocado with a squeeze of lime juice. Spread whipped cream cheese on top of your toddler’s favorite crackers. 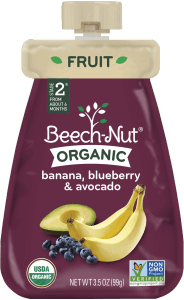 Dollop a teaspoon of a Beech-Nut organic banana, blueberry & avocado pouch (or your favorite jam) on top and serve. You can keep the rest of the pouch for a healthy snack later on in the day. 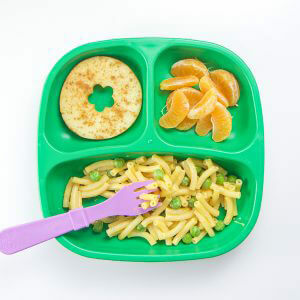 Butternut squash mac and cheese + peas, apple rings with cinnamon and orange sections. Prepare the noodles from a normal size box of mac & cheese (this is our favorite brand). Follow the instructions for making the cheese sauce, except only use half of the package of cheese powder and instead add 2 heaping tablespoons of Beech-Nut’s just butternut squash purée. Stir in the noodles with 1/3 cup fresh or frozen peas and serve. 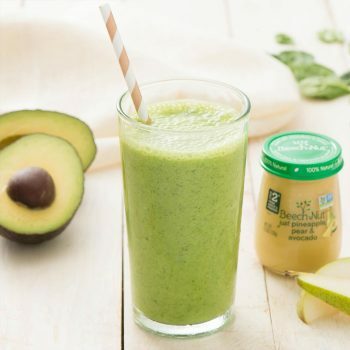 Wanna make it homemade? Here is my very popular recipe for homemade Butternut Squash Mac & Cheese. 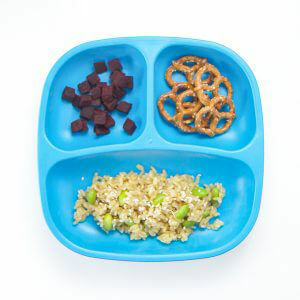 Mango rice + edamame, roasted beets with nutmeg and pretzels. In a small skillet over medium/low heat, whisk together 2 tablespoons Beech-Nut just mango purée, 1 teaspoon soy sauce, 1/2 teaspoon sesame oil and a pinch of garlic powder. Add in 2 cups of cooked rice, 1/2 cup of shelled edamame and stir until everything is incorporated. Feel free to add in some leftover chopped eggs into this recipe for a more authentic fried rice dish. Sprinkle with sesame seeds and serve. Fast Tip – I always keep a bag of frozen pre-cooked rice in my freezer for fast meals like this one. 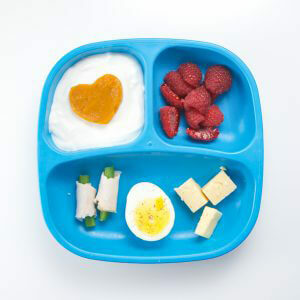 Cubed cheddar cheese, hard boiled egg with pepper, green bean and turkey roll-ups, pumpkin yogurt and chopped raspberries. Spoon some Greek yogurt into a small bowl or section of the plate. Place a cookie cutter (any shape works here) into the yogurt and gently press down. Spoon in just pumpkin purée and push around the purée until the entire cookie cutter shape is covered. Gently remove cutter. Any purée or jam will also work in this recipe (recipe for easiest homemade jam can be found here). Healthy lunchable cheese and crackers, just pear purée with a pinch of nutmeg and chopped honeydew melon.